Your weekly source for important dates, events, and announcements. 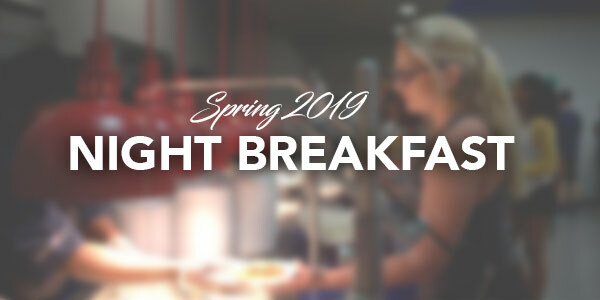 Night Breakfast: Spring 2019 is this week! You are invited to the Spring 2019 Night Breakfast! Take a break and reenergize with your favorite breakfast foods, fun activities, giveaways, & more! Night Breakfast is free for all FAU students. See below for specific date, time, and locations. Florida Atlantic University and Old School Square present featured films from the Banff Mountain Film Festival. The 2018/2019 World Tour brings films from the annual Banff Mountain Film Festival to about 400 communities around the world. From an exploration of remote landscapes and mountain cultures to adrenaline-fueled action sports, films in this year’s world tour are sure to bring out the explorer in you. The event will show some of the best films from the 2018/2019 festival. The total show time is expected to be 2.5 hrs - 3 hours. Seating is limited. What is The LeaderShape Institute®? The LeaderShape Institute® is a six day leadership experience that challenges participants to lead with integrity™ while working towards a vision grounded in their deepest values. Participants explore not only what they want to do, but who they want to be. The week is intended to produce a breakthrough in the leadership capacity of participants — benefiting them individually, as well as their respective communities and the organizations they will go on to lead and serve in the future. Day Two: "The Value of One, the Power of All"
Day Three: "Challenging What Is, Looking to What Could Be"
Day Four: "Bringing Vision to Reality"
Day Five: "Living and Leading with Integrity"
Day Six: "Staying in Action"
For more information, please contact the Weppner Center for LEAD and Service-Learning at (561) 297-3607 or email leadandserve@fau.edu. Register for the Entrepreneur Boot Camp! Work alongside faculty and community mentors to develop a business plan. Entrepreneur Boot Camp is made up of eight sessions and includes access to mentor consultation via the Entrepreneur In Residence program. All participants will receive a Florida Atlantic University Certificate upon satisfactory completion of all sessions as well as assignments, individual study assignments, learning assignments and class discussions. This event will take place on Wednesday, Oct. 2 at 6 p.m. In honor of Florida Atlantic University’s Spring and Summer 2019 graduates the Student Alumni Association and the Office of Alumni Relations invites you and two guests to our new event Toast to the Grads on April 26 at 5 p.m. in the FAU Stadium. Enjoy hor d’oeurvres and a cocktail hour with your fellow graduates along with a champagne toast, picture opportunities on the 50-yard line and a commemorative takeaway glass. Florida Career Centers are pleased to announce the upcoming Statewide Job Fair in Orlando on May 8, 2019 hosted by the University of Central Florida. This is an excellent opportunity to meet employers recruiting students and alumni for full-time and part-time professional opportunities! To register for the Statewide Job Fair, visit https://fau.joinhandshake.com/career_fairs/9423/. Additionally, FAU will be provided bus transportation to students who are attending, RSVP on Handshake. Now that it is the end of the semester, are you thinking about what to do with your textbooks? We have the perfect option for you- Donate them to the library! Instead of selling the books back for a fraction of what you paid, you can donate them to the FAU Libraries to help build up our textbook reserves collection, which helps students save some serious cash. Now through May 1, the Wimberly Library will be accepting your used books at the Service Desk located right when you come in the door or at either of the two book drops on the Breezeway! Need Money To Buy Books! Short-Term Advances for students starting Summer 2019 classes on May 4, 2019 will begin to disburse April 30th 2019. Short-Term Advances for students starting Summer 2019 classes on May 11, 2019 will begin to disburse May 7th 2019. Visit www.fau.edu/finaid/types-of-aid/books.php for more details and eligibility requirements. College of Medicine students will need to contact the Director of Financial Aid in the College of Medicine Ellen Gomes: gomese@health.fau.edu. May 15, 2019, from noon-1:30 p.m. in the FAU Davie Student Union Learn more about the benefits of technology in our creative world with representatives from Google! Registration is required. Sign up by visiting bit.ly/faugoogle2019 and scrolling to "find a workshop near you" to select our FAU event. The 2017 and 2018 Atlantic Hurricane Seasons have been the most destructive in an long time, and just as people helped us recover from Hurricane Irma, we will also be traveling to the Florida Panhandle to help our neighbors to the north recover from 2018's Hurricane Michael. At 12:15 p.m. on October 10, Hurricane Michael made landfall near Tyndall Air Force Base in the Florida Panhandle near Panama City with winds of 155 mph. Since the hurricane, FAU is partnering with 850mission and Florida Campus Compact to help in the recovery effort. Click here to register for this trip, the participant fee for this trip will be $125 which covers meals, lodging, and transportation. How much do you know about our national parks? Well, it's time to test that knowledge with some trivia from the Libraries' Government Information and Maps Department. Stop by to win some prizes and help us kick off National Park Week, which starts April 20! Wondering what Florida Atlantic University Student Government has been up to this year? This Year in Review summarizes all of our accomplishments and achievements in 2018-2019 academic year. The application for the 2019-2020 Career Living Community is now open! The Career Living Community is a program, offered by the Career Center and Housing and Residential Education, that provides sophomore students with the opportunity to develop their resumes and learn about career readiness through paid, on-campus internships, strategic training and career development. Become more connected to FAU! ALL MAJORS ARE WELCOME TO APPLY! For more information and to apply, visit https://fau.joinhandshake.com/jobs/2443129/. Congratulations on your upcoming graduation, seniors! We hope during this exciting and busy time you can take a moment to reflect on your time here at FAU as well as the importance of giving back to the place you can call a forever home. The Office of Annual Giving encourage all graduating seniors to give a gift in honor of your graduation year of $20.19. All Senior Class Gift donations will be directed to the Senior Class Gift Scholarship fund. The Senior Class Gift Scholarship is a fund that provides financial assistance to both juniors and seniors who run the risk of not receiving their diploma due to financial obstacles. By donating today, you can help the future graduation efforts of Owls to come.